Using proven, repeatable techniques there is little risk and great rewards involved in marketing products for profit. When you use keywords that people are searching for, you naturally drive traffic to your site, which in turn makes you money online. 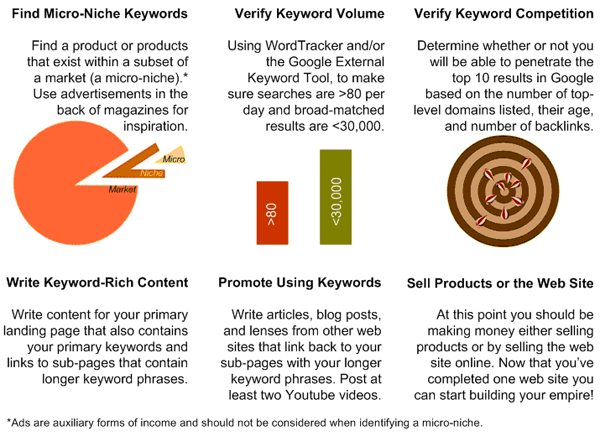 But how do you find the right keywords and how do you know what people are searching for? Find Micro-Niche Keywords – Identify a micro-niche inside a penetrable market that has profitable products that people are already selling. A micro-niche is a subset of a market niche. Verify Keyword Volume – Using WordTracker and/or the Google External Keyword Tool, make sure searches are over 80 per day and that there are under 30,000 search results overall. Verify Keyword Competition – Determine whether or not you will be able to penetrate the top 10 results in Google based on the number of top-level domains listed, their age, and number of backlinks. Produce Keyword-Rich Content – Write content for your primary landing page that also contains your primary keywords and links to sub-pages that contain longer keyword phrases. Promote Using Keywords – Write articles, blog posts, and lenses for posting on other web sites that link back to your sub-pages with your longer keyword phrases. Post at least two Youtube videos. Sell Products or the Web Site Itself – At this point, if you followed all of the steps, you should be making money online by selling products. If not, then consider selling the domain for a profit online at Flippa or Sedo. The rate of success with this method is roughly 1 out of 8 and marketing and testing can take anywhere from 1 to 30 days. Success is defined as more money coming in than is going out each month and that includes all opportunity costs (time that could have been spent making money in other activities). Tracking is critical not only with the data of the results, but with the finances and time spent. what are some jobs for freelance writers in newspapers? Consider offering to write a column with them on a trial basis for free first, but make sure it has an experation on it so you can eventually get paid. If they don’t hire you, you can use the experience to get another paper to hire you. You might also consider writing a book and publshing it as a Kindle ebook on Amazon for free to boost your credibility. Writing for the Kindle is a matter of knowing HTML, but as simple as writing in Word and saving as an HTML file and uploading to kdp.amazon.com. Cheers!